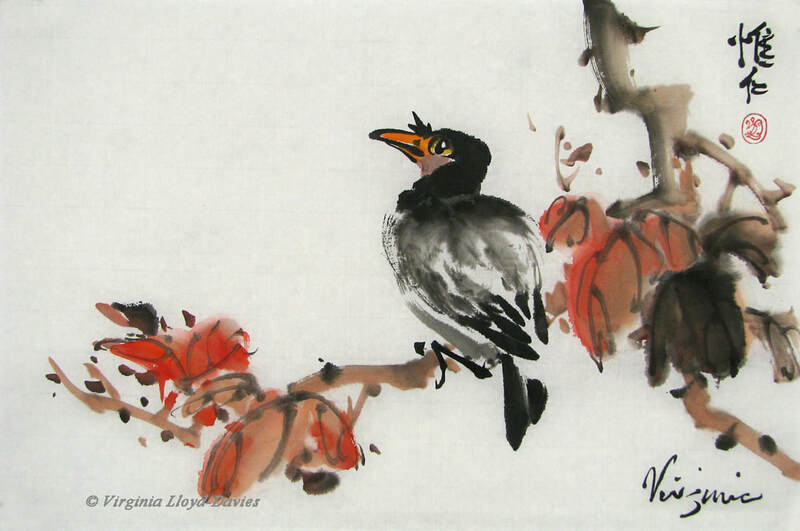 This colorful birdie jumped out of the brush at the top of a rather uninspired bamboo painting. With a little sneaky cropping, I saved the good part! Never underestimate the power of cropping: If you are unhappy with a painting and don't know why, try masking off one of the sides and see if that improves the composition. Sometimes we hate to let go of a favorite element ("look what a wonderful rock I created here! "), but by trimming that bit off, the picture suddenly makes better sense. 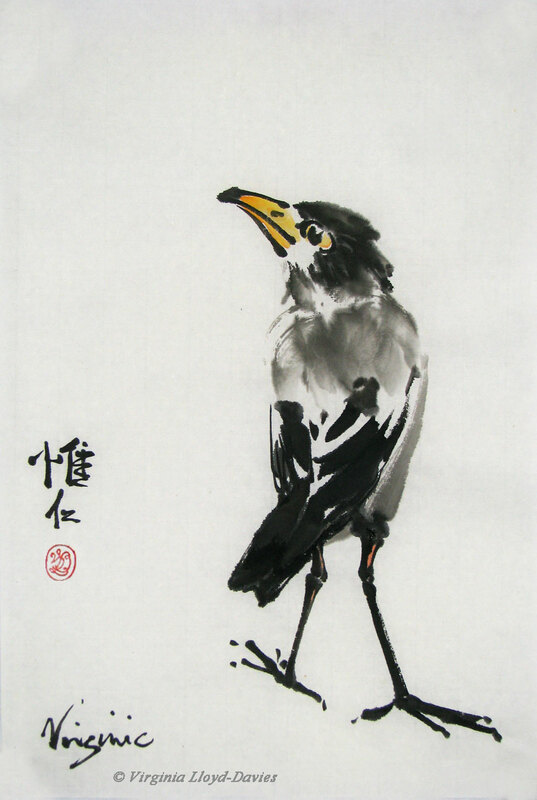 My sumi-e birds just pop out of the brush on to the paper. I rarely plan them out and while I do attempt to get them somewhat anatomically correct, I realize that often exaggeration is what makes them successful. Like this one: I asked my Facebook followers to give me names for him and I loved the variety of suggestions: "Lord Horty", "Wellhellow", "Crook" and "Themistocles", were offered, then there was "Archibald", "McGrackle" and "Ronald". 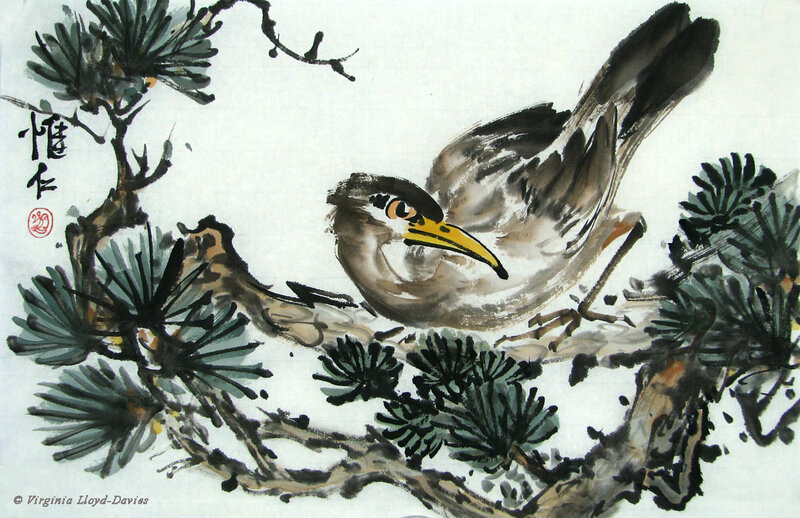 I think my favorite for elegance points was "Ba Da Shan Wren", a hilarious international word play on the artist Bada Shanren, who painted very funny birds, and of course "Wren", one of our smallest birds. What kind of bird is this? Not a clue! I just put some body parts together and then got excited when I saw how well the wing feathers came out! Tip: if your strokes are strong and self-confident, you can get away with anything! Here we have a sophisticated strutter with his nose in the air. I suspect his feet are going in the wrong direction, but does this really matter? This trio is waiting for the bus. 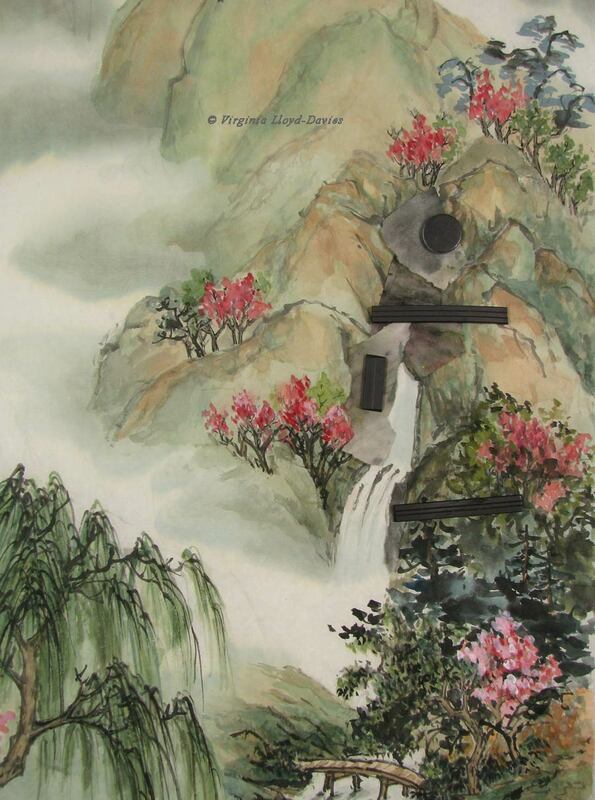 I think if I were going to paint something similar again, I would put less detail in the lotus background. The birdie bus queue is strong enough with just a few lotus leaves sketched in - or perhaps a British bus stop sign on the left. This bird's eye is far too big, but clearly we've gone way beyond naturalism here. I liked the way her back feathers turned out and the jolly autumn leaves give her a nice setting. Sometimes you just have to go for it. 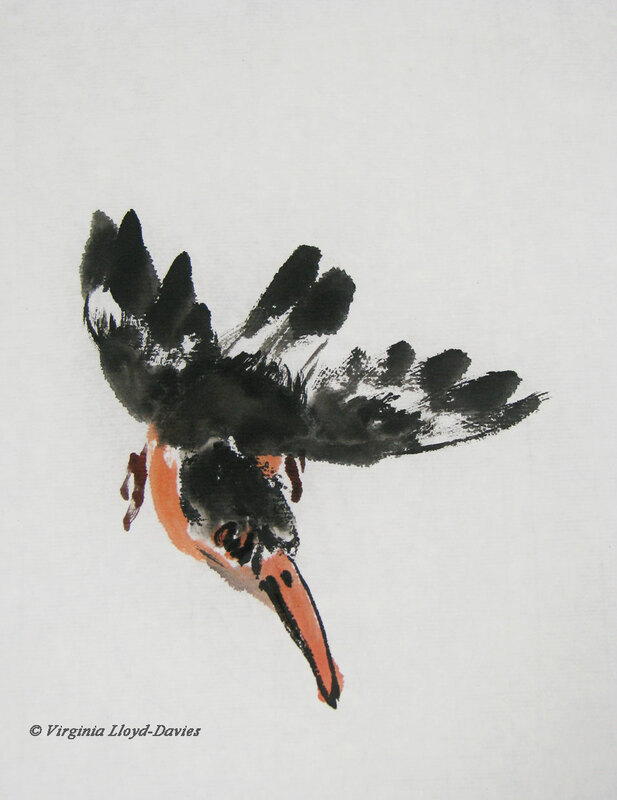 This kingfisher has got its eye on the prize - fish lurking below the lotus - and the twist of the body gives it the dynamic movement of sumi-e. Sometimes it takes an icky disaster (the bird in the middle) to loosen up enough to create the ones that do work. 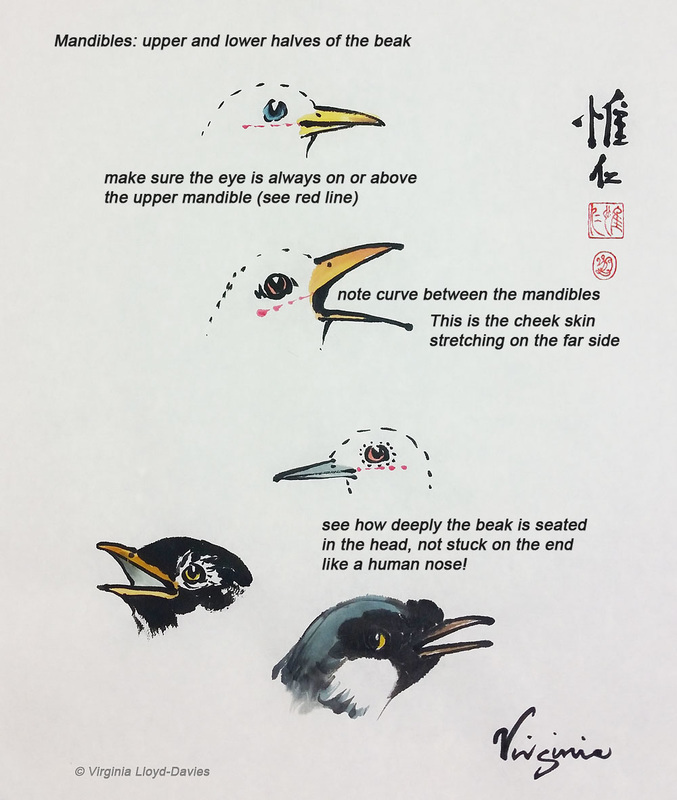 One of the reasons that the bird in the middle didn't work is that I'm right-handed, and painting a beak at that angle is tricky. The eye then had no character, probably because I already knew I was doomed, and the feathers were unspeakably bad. 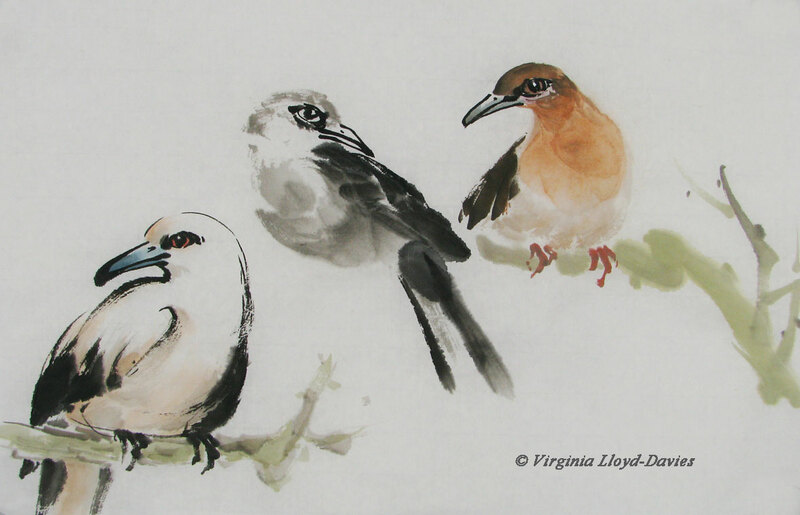 I was by that point sufficiently annoyed to stop controlling the brush and just let it happen, hence the other two birds which look quite good. 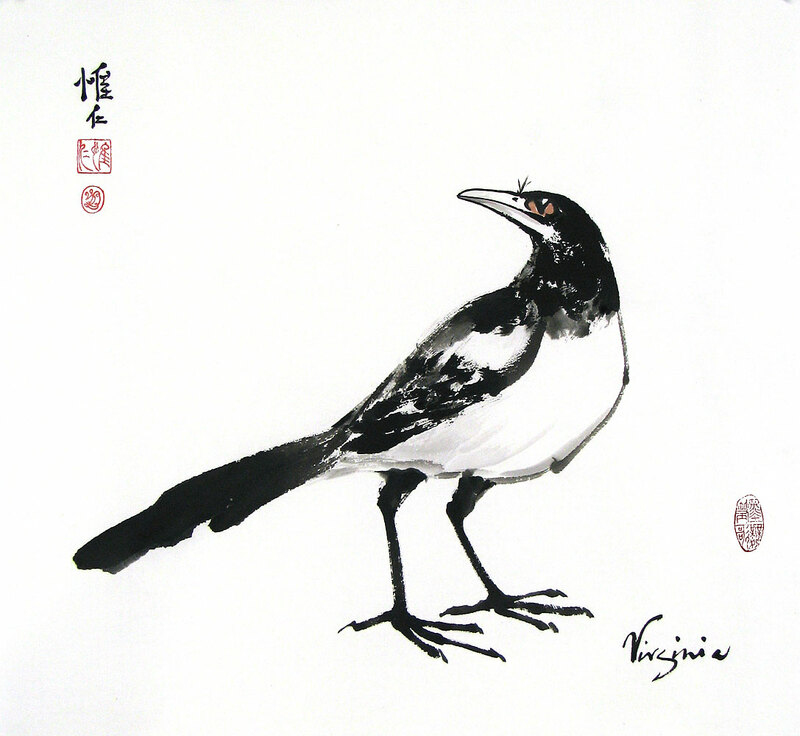 Now here's an elegant magpie. In Britain they are attired in fashionable black and white. In China and Africa they may have iridescent blue and green feathers and bright red eyes. And of course you might decide to design a completely different color scheme. This is the secret - you're the artist so you are the one in charge! 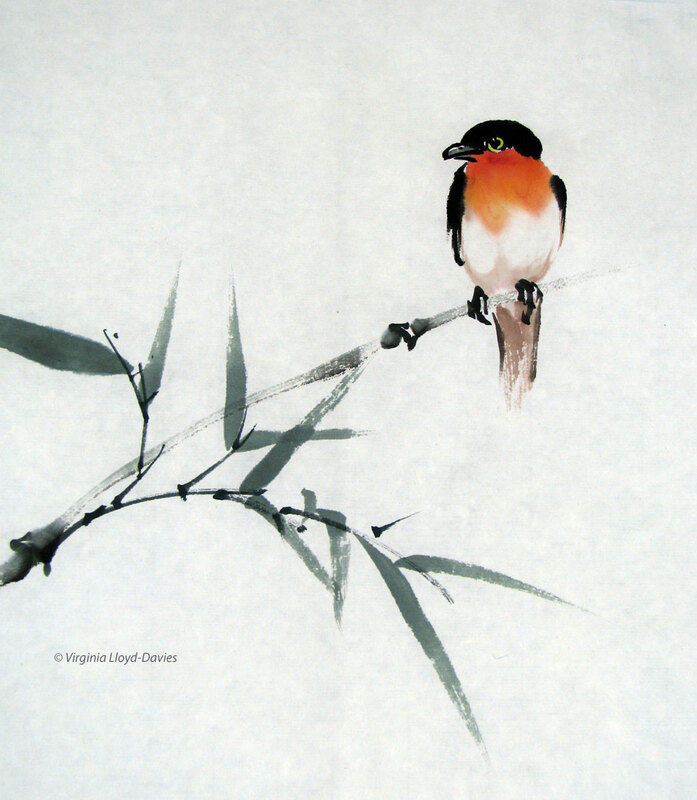 Chances are, there is a bird somewhere in the world with the plumage you choose! Go for it! You can see more of my bird models here. Happy painting! I painted this 18 years ago and I remember thinking I wanted it to be bubbly and springlike. 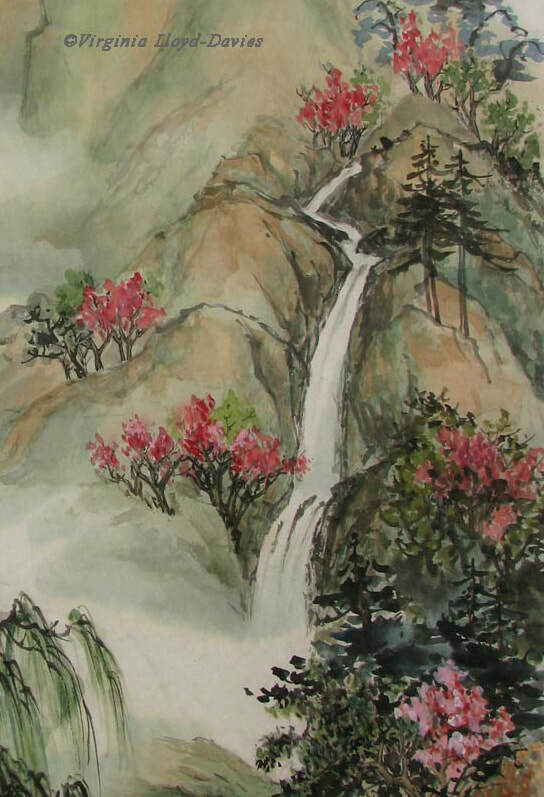 I held on to it because I liked the airiness of the composition and some of the elements - the cabins, the willow and the bridge, for instance - but I knew I had problems with the waterfall and I positively hated my little 'bunches' of red trees. Clearly I had little idea of how to integrate rock and vegetation. It felt unfinished, but back then I didn't know how to progress the painting. I decided to see if I could 'fix' some of the problems as an exercise to train my eye to see alternative choices. Here are some of the areas I decided to change. 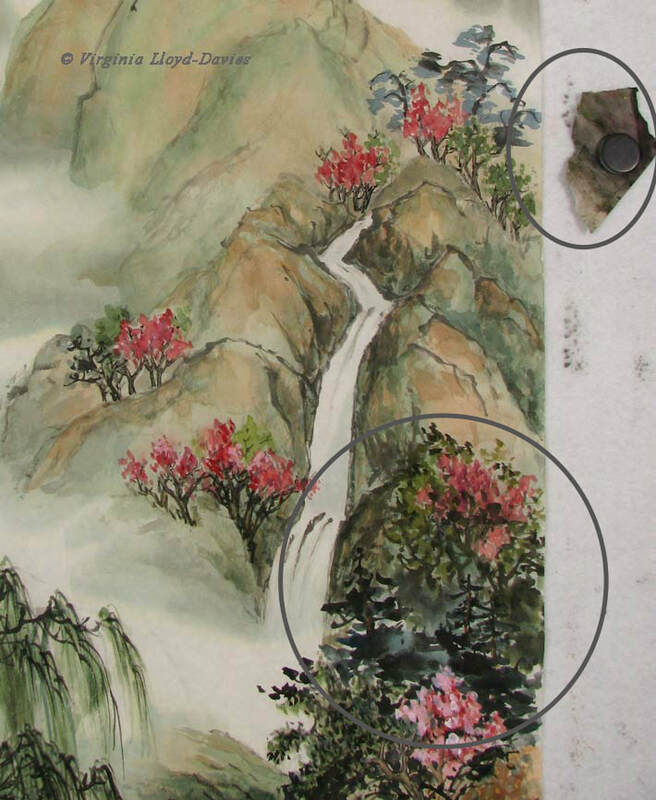 I will add more bluish-green pines on the left behind the flowering tree. My reason is to hide the nasty humpy black hill strokes (bottom left circle). Above them, I will make those trees on the left a bit bigger (second circle) because they are the same size as the nasty little red trees on the right and they need to be bigger because they are closer. I'm still unsure of what to do with those wretched little red trees on the right. 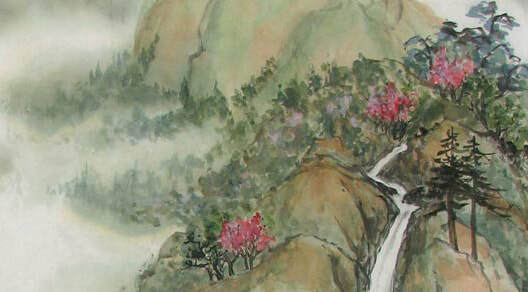 I have added some more pines below them which has helped to make the wretched reds recede a bit, but it has also cut off part of the layer of mist (that white band) which, in Chinese painting vocabulary is the equivalent of "....." meaning: there is more landscape between the two layers but the mist indicates that things are further back. Here's the brush I used to make these corrections: it's a mixed hair which comes to a good point. I tried to match the size of the brush with whatever I used 18 years ago, but since I can't remember what brush I used last week, I basically had to guess. Living dangerously: I have added more trees on the right (lower circle) so that bunch of wretched reds is now subsumed in among green foliage. The downside of this action is that I have now completely lost the mist that indicated the distance between the bridge in the foreground and the rest of the vertical waterfall. Thinking about it in retrospect, I could have tried modifying the red trees with some opaque color such as brown or green, which might have made them less noticeable instead of joining the two areas. I am starting to feel like a card shark, trying to fool the viewer's eye. When in Doubt, Throw Color at it! 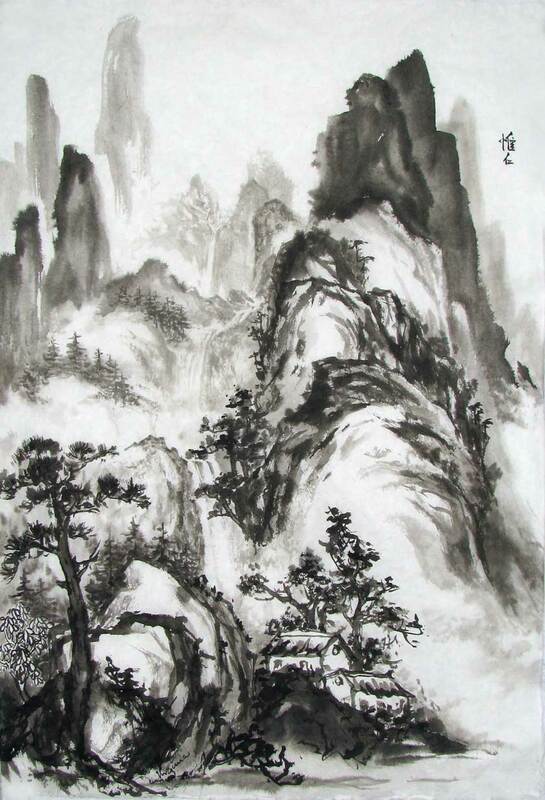 Using just black ink and shades of grey, I started off sketching the rock and tree on the left and worked my way up the scene, spraying lightly with water to dampen the paper in the distance. This softens the outlines. My mulberry paper came from Blue Heron Arts, where you can find an excellent selection of paper, brushes and other painting supplies. 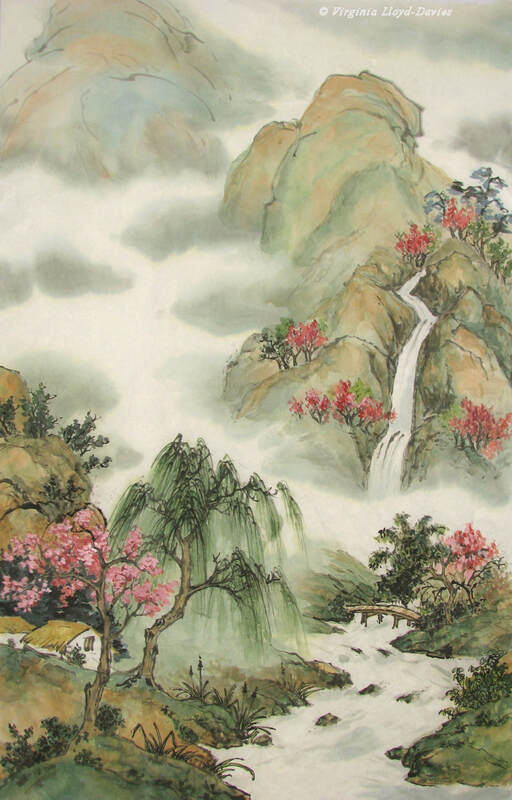 Rather than leaving the center area open for mist, I opted for showing a meandering waterfall in the distance. I left several areas open for mist. Adding light color....Uh-oh, it's all looking a bit brown! The addition of color has taken away from the strong contrast between the black ink and white paper, leaving it looking a bit muddy. Hmmm, I've added a bit of light, transparent green to the mountains, but it still looks a bit dreary. Sometimes 'going for broke' is the most fun of all. I had no idea if the mineral colors would be too much, but I really like it, which is ultimately what counts. Break the rules! Find your own style! It's just a piece of paper, after all! Good luck and happy painting! Since I had no composition in mind, letting this long, bouncy brush (from HMay Art) spring from rock to rock seemed like fun. My paper is a thin, raw xuan so my brush needed to be on the dry side. 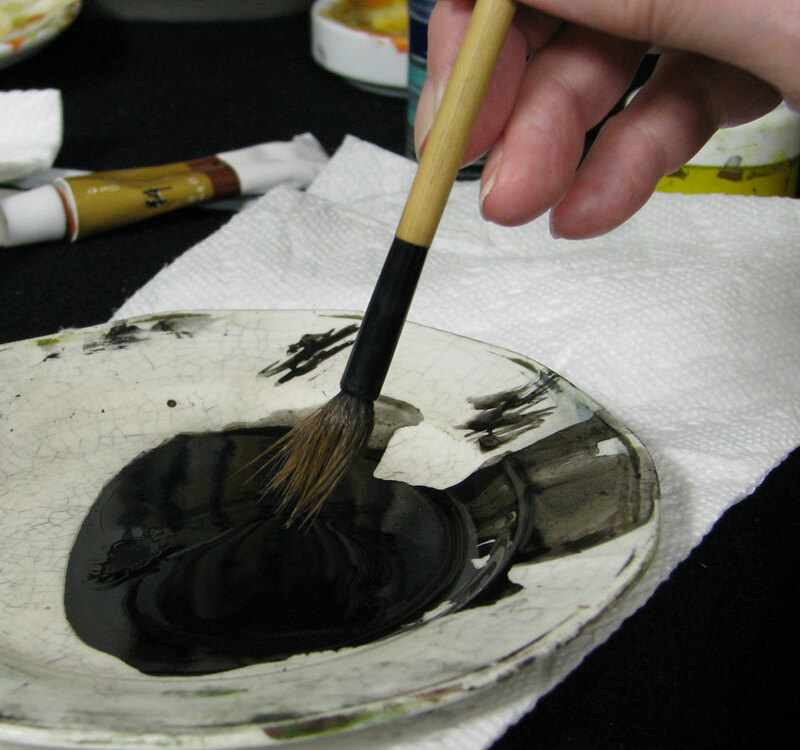 I loaded it with grey then added ground black ink to the tip of the brush. ​Tip: It's always a good idea to keep a scrap of practice paper next to your ink so you can check the color and the amount of moisture on your brush before touching your painting. Some of the strokes look almost abstract. How about some foreground to help the image to emerge? As soon as I add foreground elements, the waterfall will recede and I will have more sense of depth. 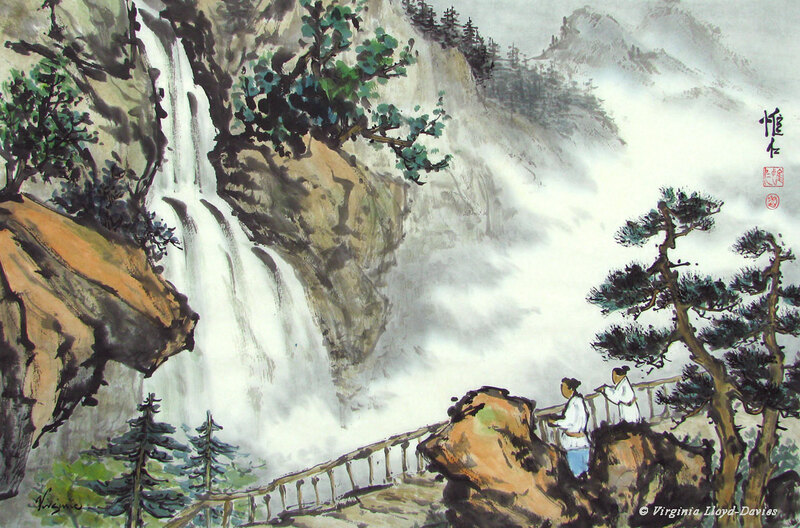 Since the waterfall has a diagonal motion, it's good to have the foreground moving on the opposite diagonal, creating a V shape. Tip: Avoid having anything begin or end right in the corner! Oh look, it's a viewing platform! In that case, I need people. True confession: the child on the right ended up too short, so I added another rock this side of the figure to cover up my mistake, thereby adding another layer of depth. The rock's a bit heavy, but you probably wouldn't have guessed my sneaky save! Tip: Switch to a smaller brush for figures (I used my Happy Dot brush from OAS). If you're not sure what size to paint the figures, try them out on a separate piece of paper and place it under your painting to see if it looks right. Keep trying until it looks good. If I had followed my own advice, I might not have needed to stick in the rock! If you add color lightly, you can always change the hue or the intensity. 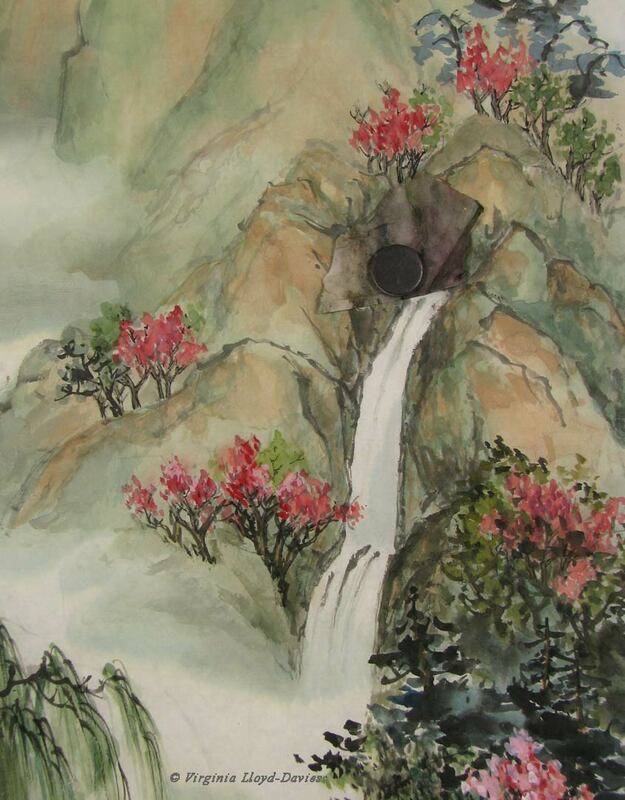 I added some light trees in the lower left to push the waterfall back a bit. I'll add a bit more detail to these pines later. I've added white to the observers' clothes, so that when I add the background misty wash, the figures will stand out more. I've extended the landscape off into the distance, being careful to keep my greys light. 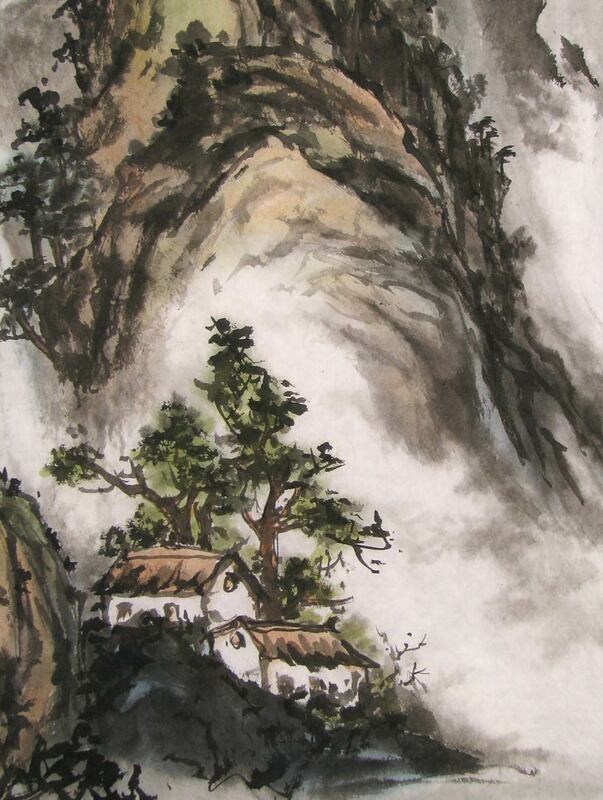 If I added black to the mountains I would need to darken everything from that point forward. 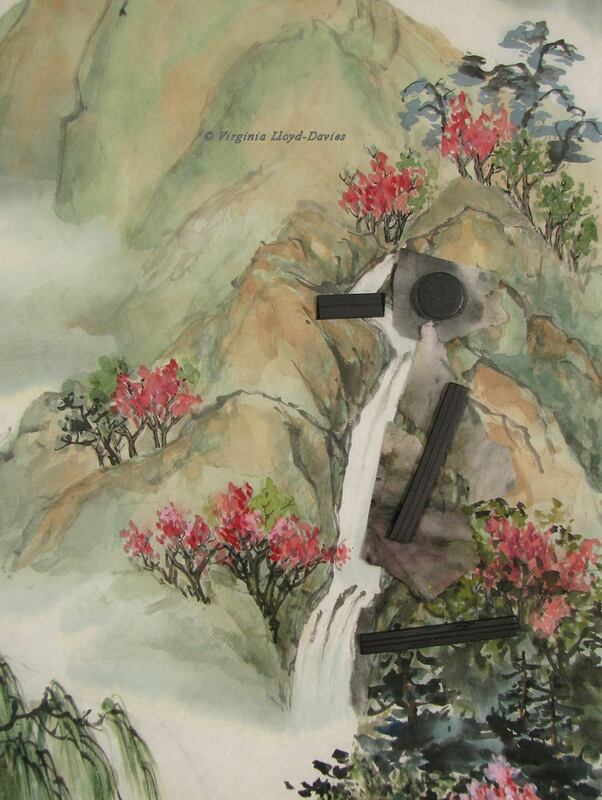 ​Next I need to create the mist, and for this I will take the painting off the easel. 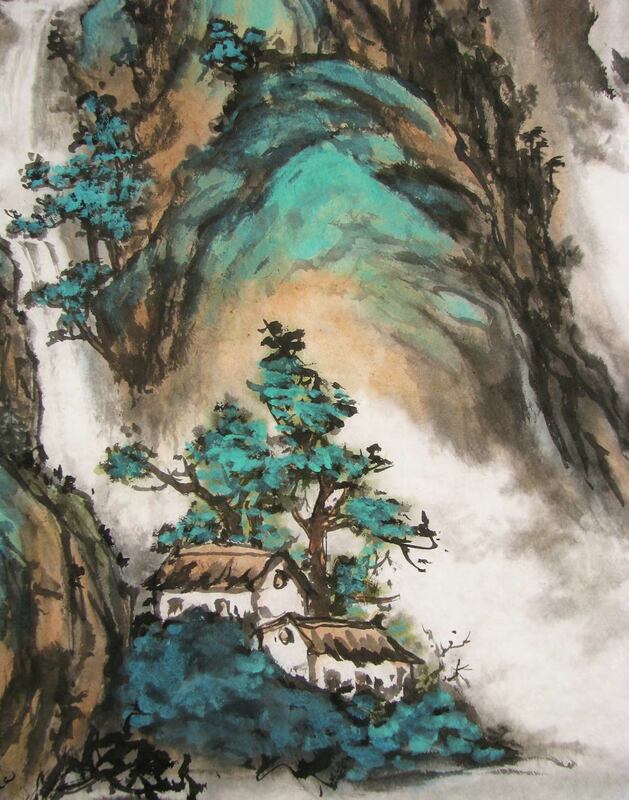 This is the painting on a black blanket. 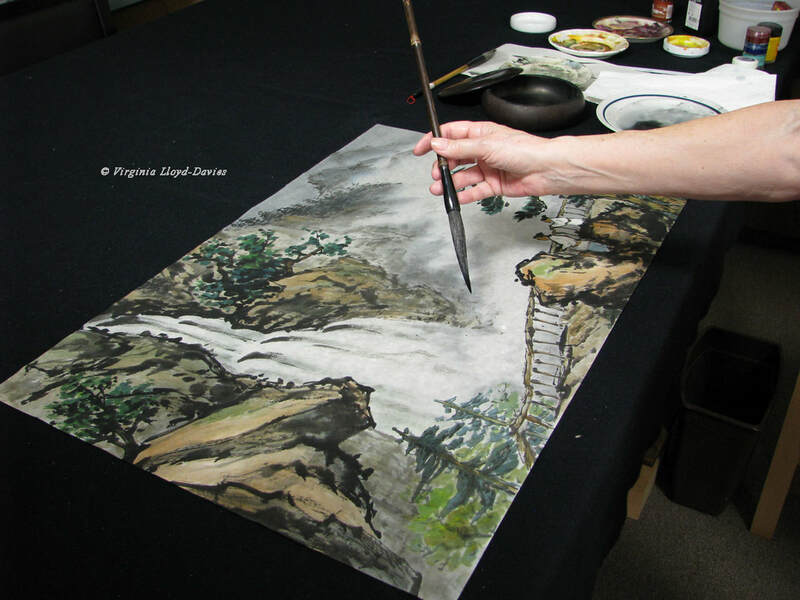 I created the background wash by spraying the painting with water and adding color on the backside of the paper. 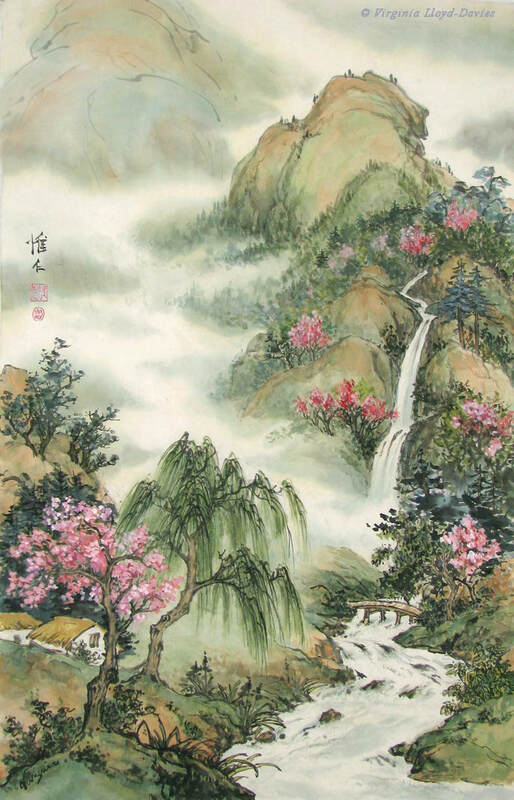 This allows a softer effect for the mist. I used indigo and black ink with a lot of water for this. 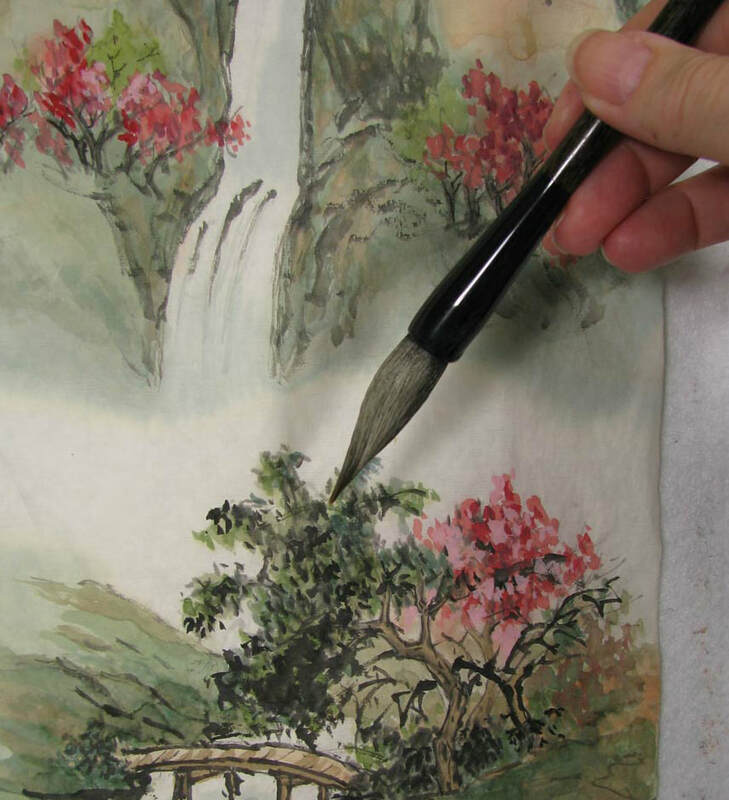 Tip: take into account, when you are mixing your color, that it will dry much lighter, especially when added to the back of the paper. Of course, if it is too light after it dries, you can do another wash. The trees and mountains in distance all looked the same shade of grey, so I darkened a few of the trees on the left which makes them look closer and adds more gradation to the depth. Sometimes you don't want your brush to come to a point. I decided my pines in the foreground needed more detail, so I added an impression of needles by splaying my Happy Dot brush (OAS) and dipping the tips in pure black. This way I don't have to paint every single needle. 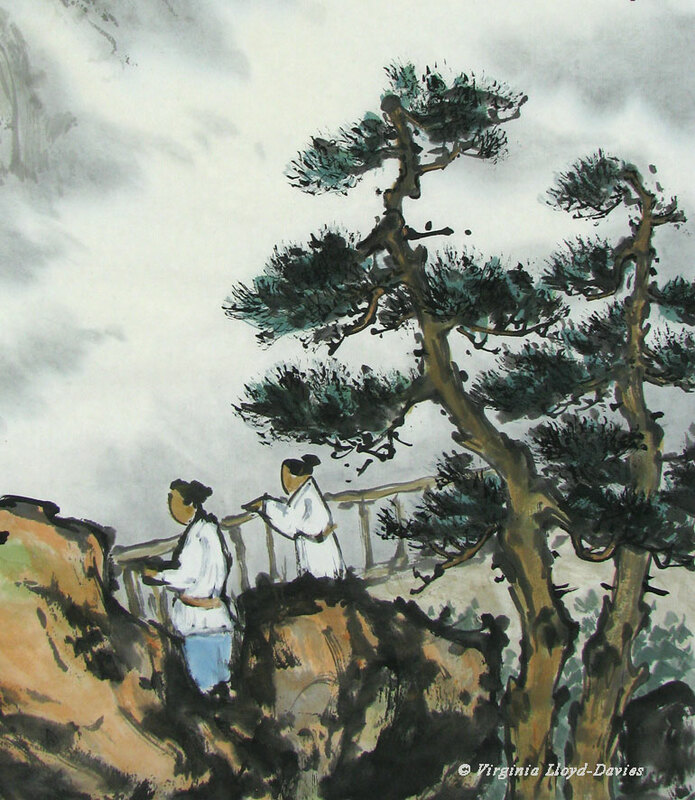 The pine trees are now bushier and more elaborate, which works for trees in the foreground. ​Tip: As trees are further away, add less detail. 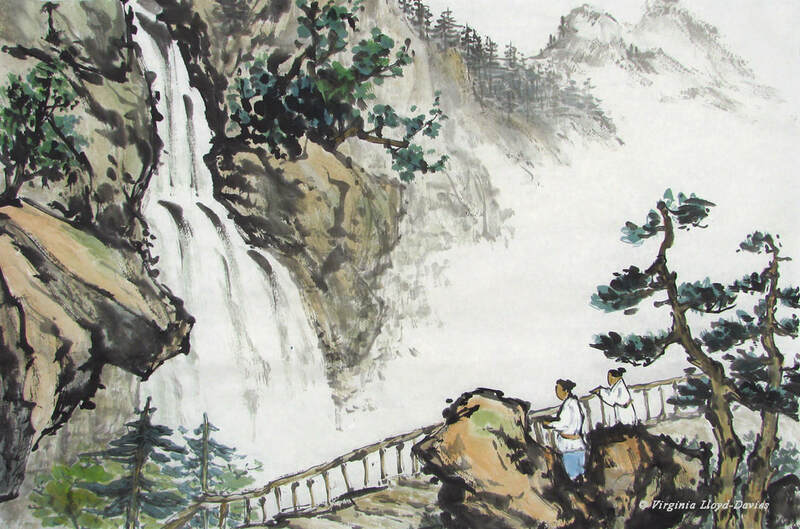 Admiring the Waterfall: completed painting. It measures 27"x 18" (69 cm x 45 cm). Did you enjoy seeing how it developed? Did the breakdown step by step make it easier to understand? Do you have questions? 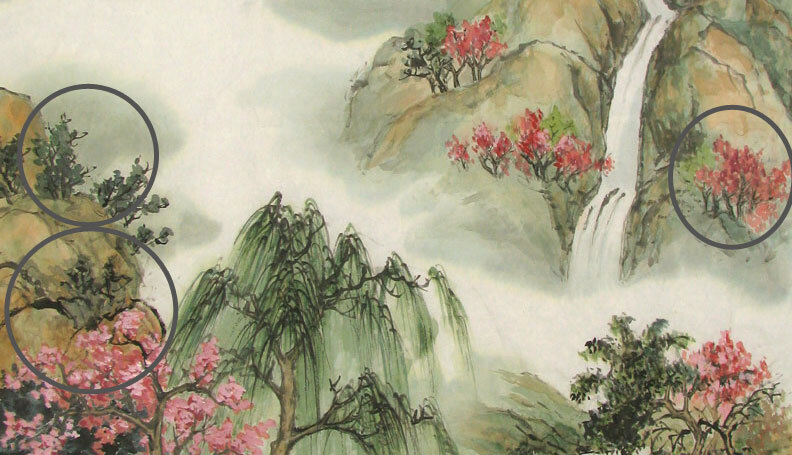 If you painted it, it would turn out differently, and that's the delight of Chinese brush painting - because the composition is a living, breathing thing, your personality, thoughts and emotions will imbue the painting with your magic. Why not give it a try? You can follow along with these photos as you paint. Have fun splashing in the ink! 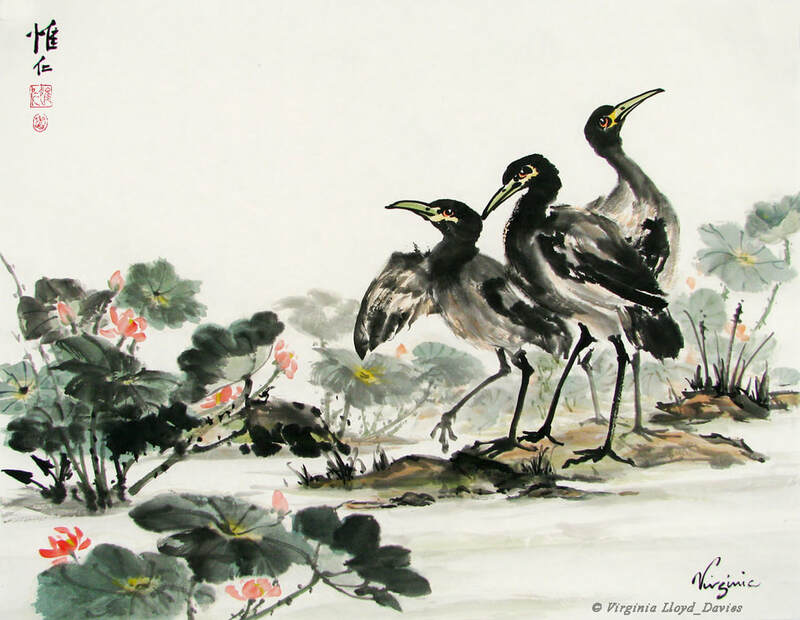 I started this sumi-e painting of Lotus and Kingfisher on thin, raw xuan paper from HMay Art (HM 004). It’s a good paper, but like all papers, it takes getting used to (note: this paper comes in white and an off-white antique look. I used the white.). 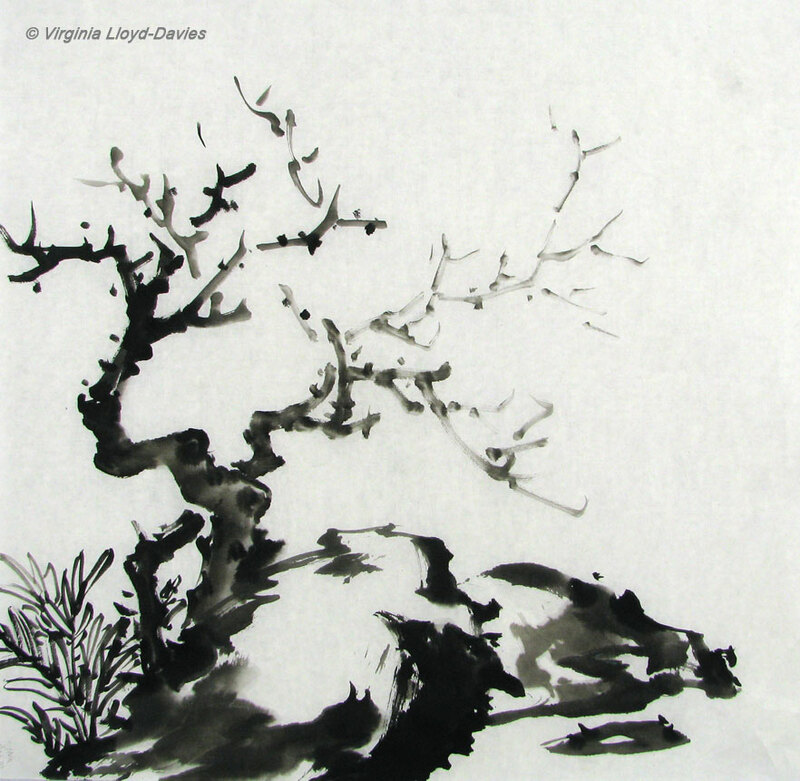 For the leaves, I chose a large brush from HMay Art that holds a lot of ink and water. 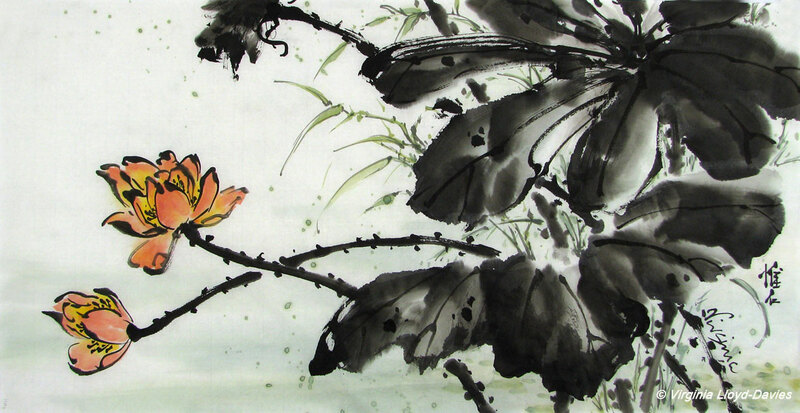 ​The paper was runnier than I expected and the black lotus leaves on the right lost their crisp edges as the ink spread. To prevent the flower petals from running, I used pure black, which was a bit harsh to my eye. Grey would have been better. I was tempted to throw the painting away and start again, but I decided to push it a bit further. ​For the flowers I used a combination of yellow, orange and red (Marie's Watercolors). Coloring the flowers shifted the attention from the leaves to the flowers, but those blurry leaf edges still annoyed me. You can watch me paint lotus flowers here. 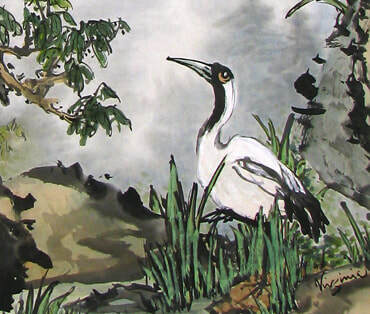 To give depth to the composition, I added green grasses and splashes of color in the background. 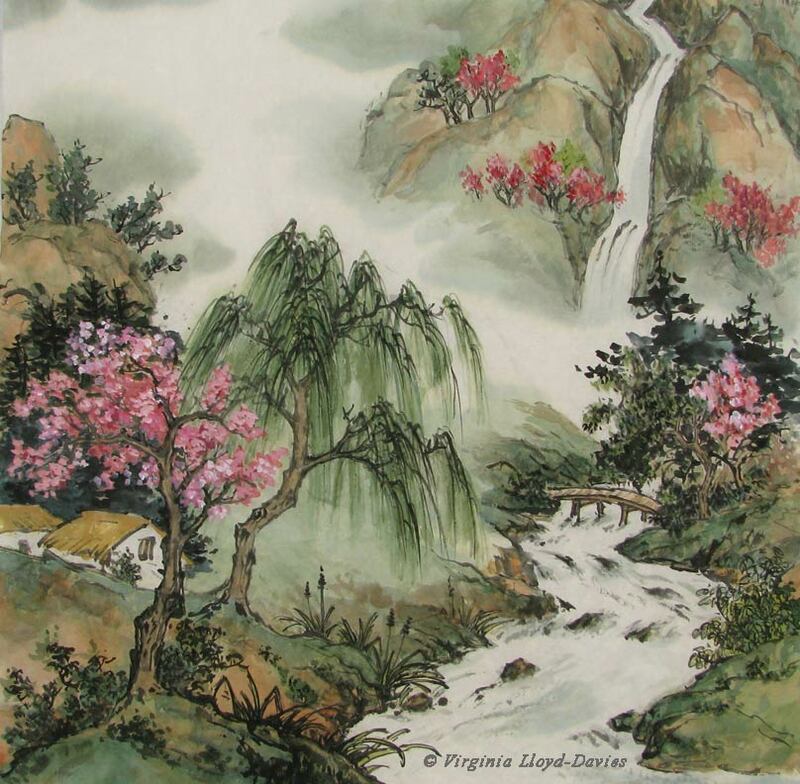 I painted them lightly so they wouldn't compete with the foreground leaves. 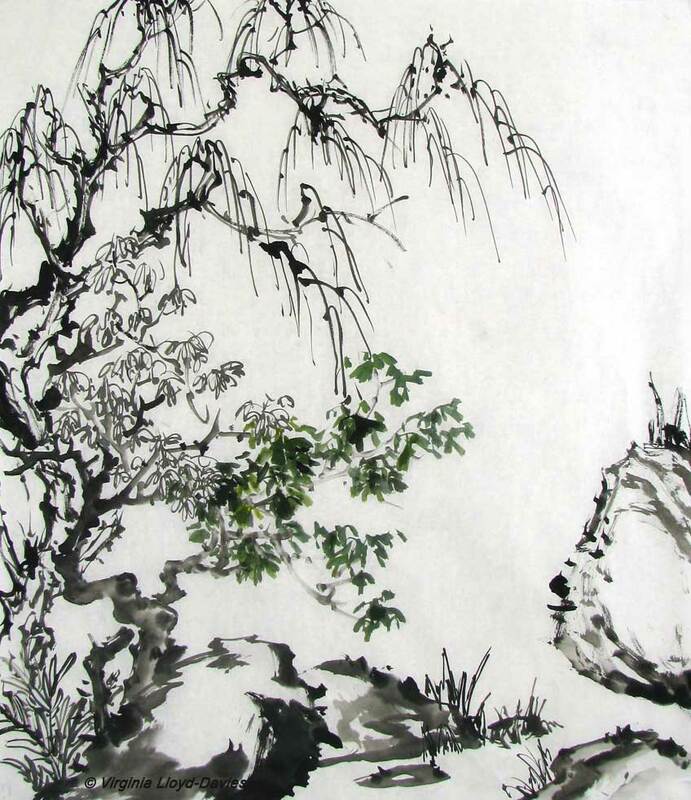 Unfortunately, my delicate strokes were totally overpowered by the black leaves and merely looked wimpy. Step 4: When in doubt, add Outline! ​Adding veins and strong black to the edges of the lotus leaves gave them more focus – which of course made the grasses look even wimpier. 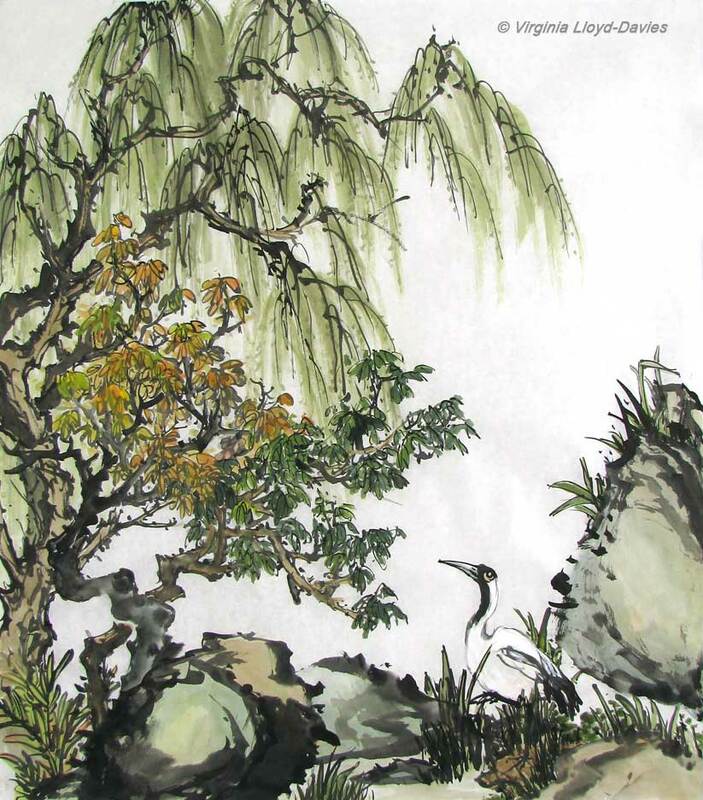 A little grey outlining on the grasses, however, gave them more weight, while still keeping them in the background. ​At this point, I decided to throw all caution to the winds and add a bird, always scary when you hope it will be the crowning glory of the painting but could turn out awful and ruin the whole thing. 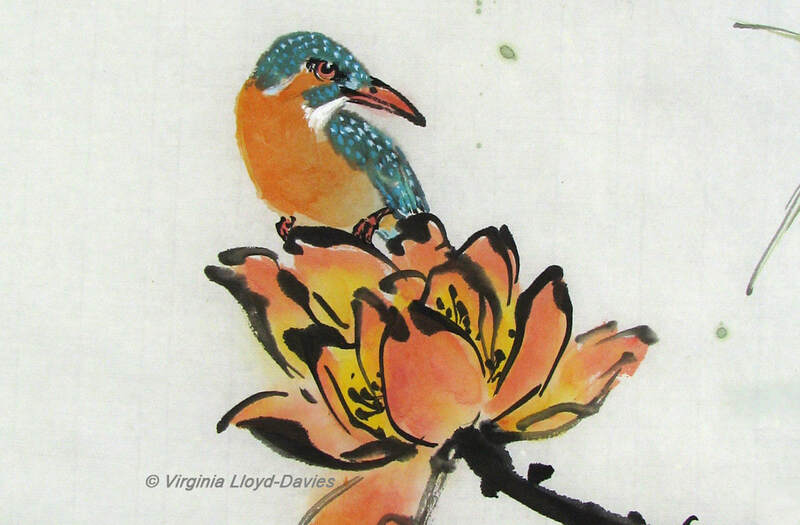 The kingfisher's belly color combines with the flower tones and leads the eye upwards, giving more mass to this flower and emphasizing its importance compared to the second, smaller flower. Step 6: Success! Risk Pays off! ​Success! Adding the kingfisher firmly stole the focus of attention from the leaves, but the bird’s turning head draws the eye back to the leaves, keeping the viewer – I hope! – happily roaming round in the scene and discovering more details. 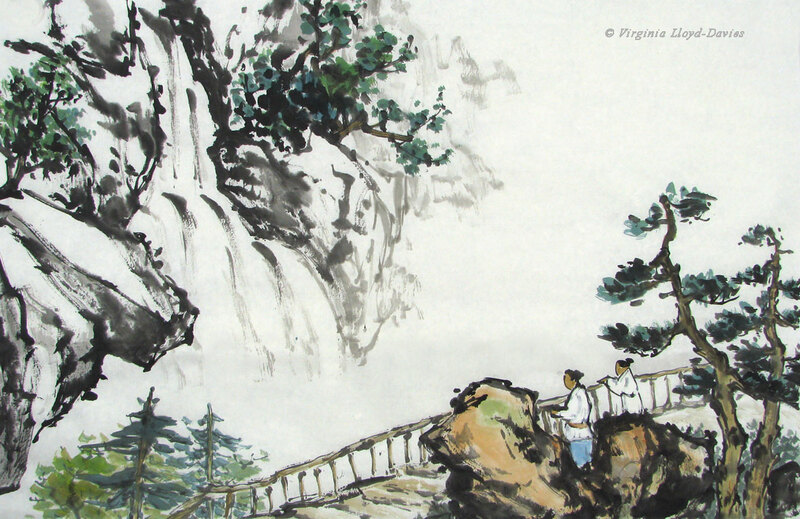 The painting measures 14"x27" (35 cm x 68 cm). The moral of the story: Never give up! The worst that can happen is you end up throwing away a small piece of paper! In the meantime, you are training your eye and your critical faculties to see possibilities, and you are splashing in the ink, which is always fun! 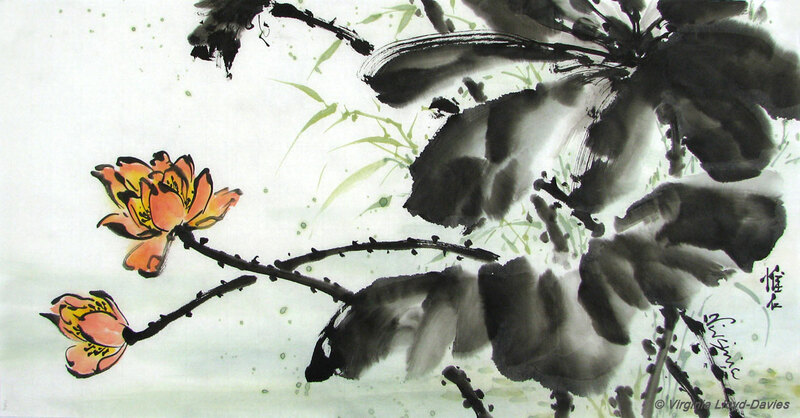 Good luck and happy painting on your lotus! ​I welcome comments and questions, so don't be shy! How did that crane get there? How does a landscape develop? Where do the ideas come from? Have you wondered sometimes just where the image came from? In some centuries, artists were encouraged to 'follow the masters' and not invent their own compositions. 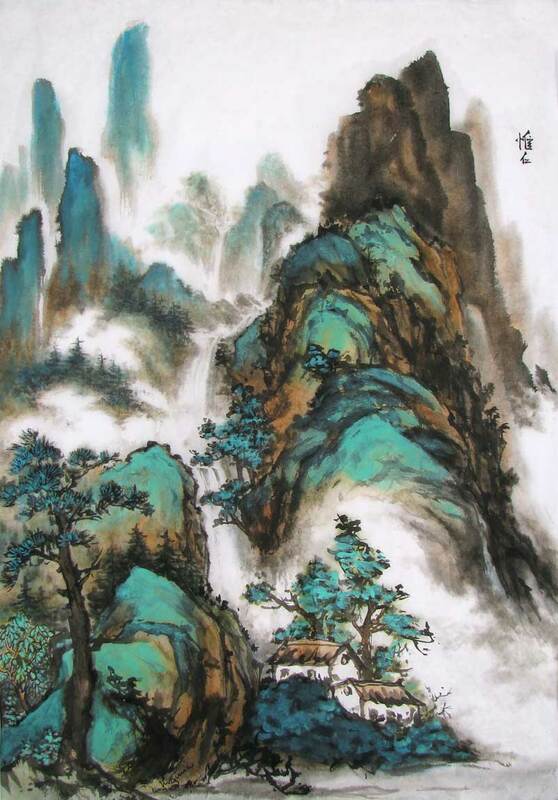 Some contemporary Chinese painters start off with a clear plan in mind; others - like myself - allow the story to unfold stroke by stroke. In most cases, the landscape starts off with trees and rocks, establishing the foreground. Here, I have suggested either a path or a stream with the rocks; I am leaving my options open because I have no composition in mind yet. 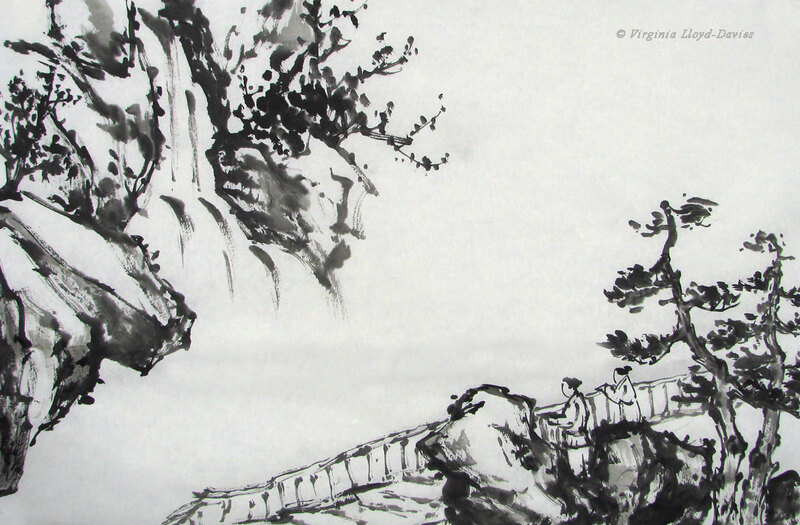 With a bouncy brush (Inkston #0503) I am letting my strokes dance on the paper - the rocks are hard and forceful, the trees are vigorous and intertwining. This is the most fun part! I don't have to think too much because I still have plenty of options. 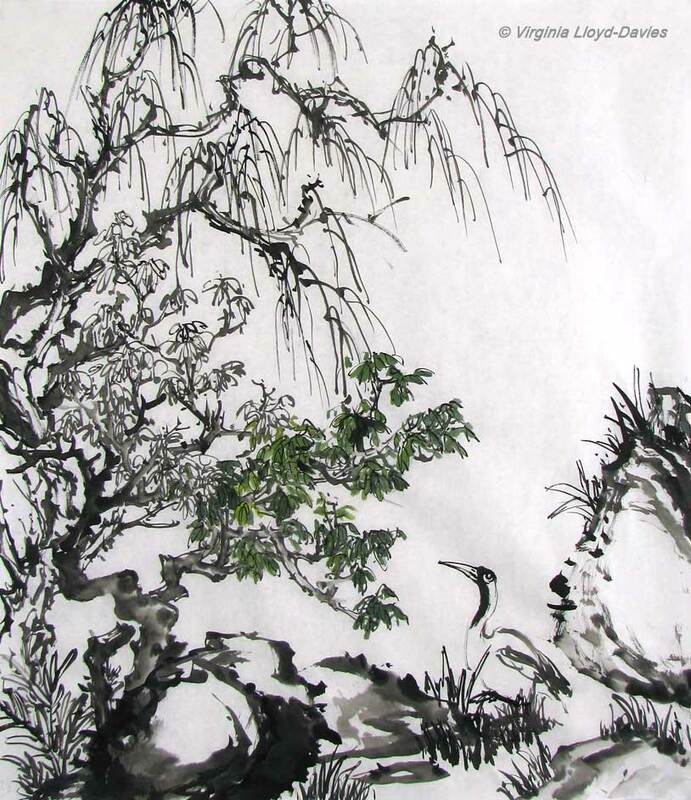 One tree has outline leaves, one has green leaves which will get veins added later, and above all arches a sprightly willow. Aha! The crane has popped in! The way the rocks arrowed down to a V made a natural place for a focal point. I could have continued the path or stream to lead the eye back into the painting, but given the size of the rock on the right that option seemed a bit cramped - options are starting to narrow! Putting the crane there looking towards the front gives another layer of depth to the composition. Time to color: I'm using Marie's indigo and yellow tubes, and brown and orange chips from Blue Heron Arts. The colors are a little pale at the moment and I will strengthen them when I put a wash on the back of the paper. 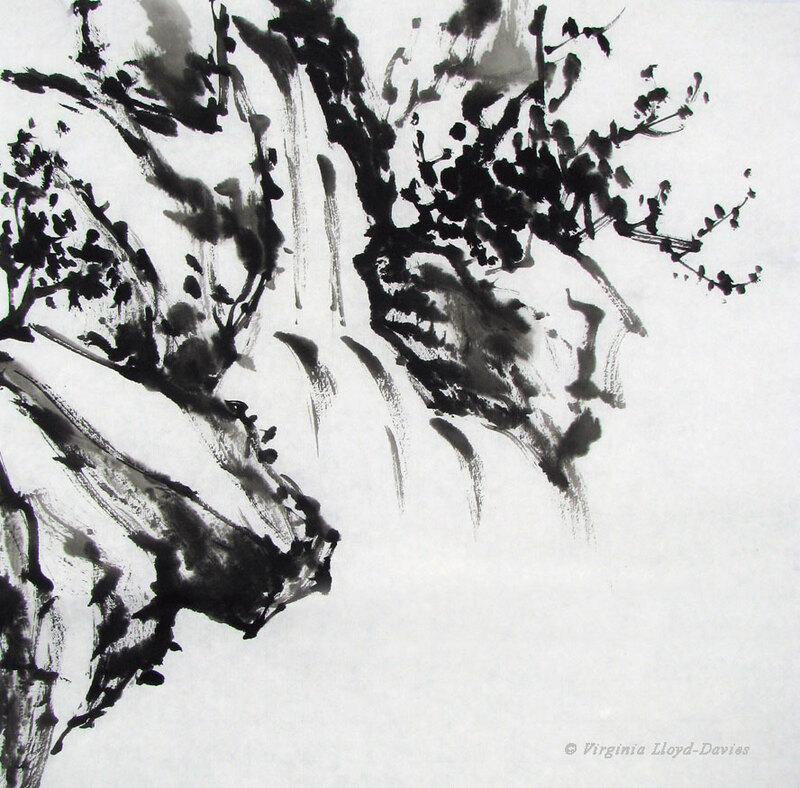 This is a thin, raw xuan, with a high percentage of Wingceltis bark which allows for a good flow of color, while still maintaining crisp outlines (Inkston Perfect 70 xuan). You can read more on tips to paint grapes in my blog post here. Please let me know in the comments section if you have questions and I will address them in this post. There is no question too dumb to ask! 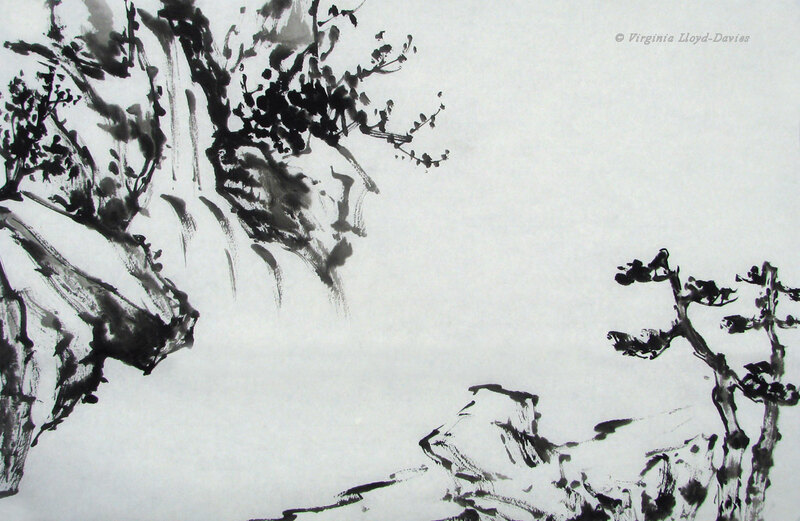 The Chinese brush style of painting that I demonstrate is called 'spontaneous' or 'splashing ink'. It is also known as 'paint the idea'. 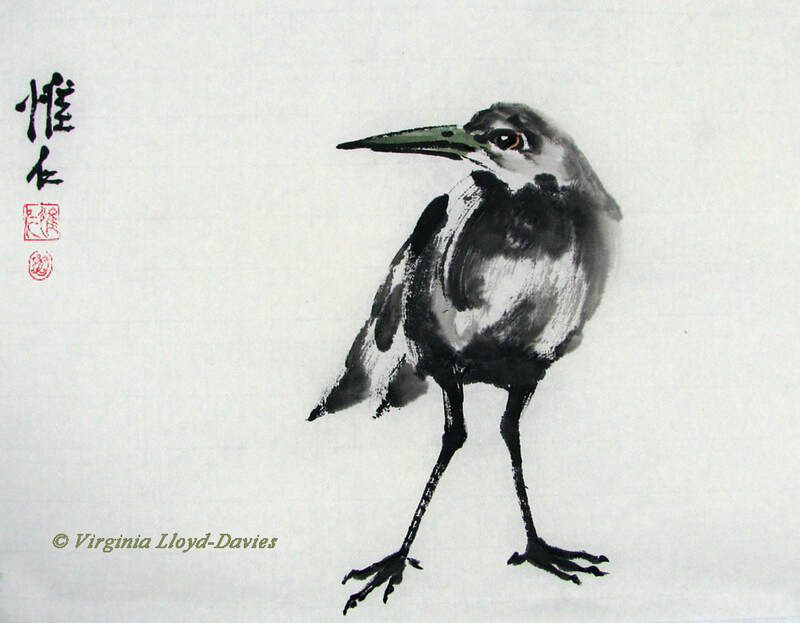 When we paint birds, we are not looking to produce a photorealistic bird, but more the idea of 'birdy-ness'. So we may exaggerate the beaks and eyes to bring out character. Frequently the birds are making a commentary on the rest of the painting so the birds need to have an aliveness that we can read into. Click on "Read More" to watch a video and see how to paint them. Lotus flowers can be painted in many different ways in sumi-e or Chinese brush painting style. In this video I am demonstrating the outline and color technique. Some artists color their flowers meticulously; because this is a quick demonstration I am using more of a 'splashing ink' style. I used dark grey ink for a gestural outline and carmine, blue and yellow for the colors. The brush is a 'Happy Dot', which has a great point and springiness. 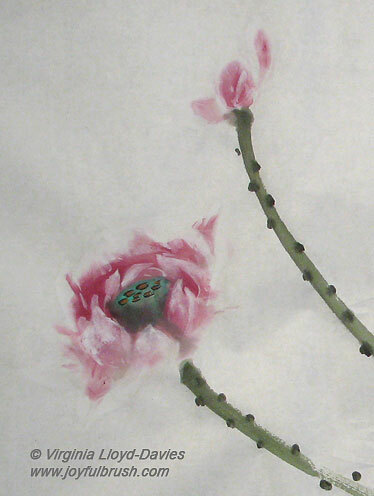 You could also add stamens in black, red or yellow when the painting dries. 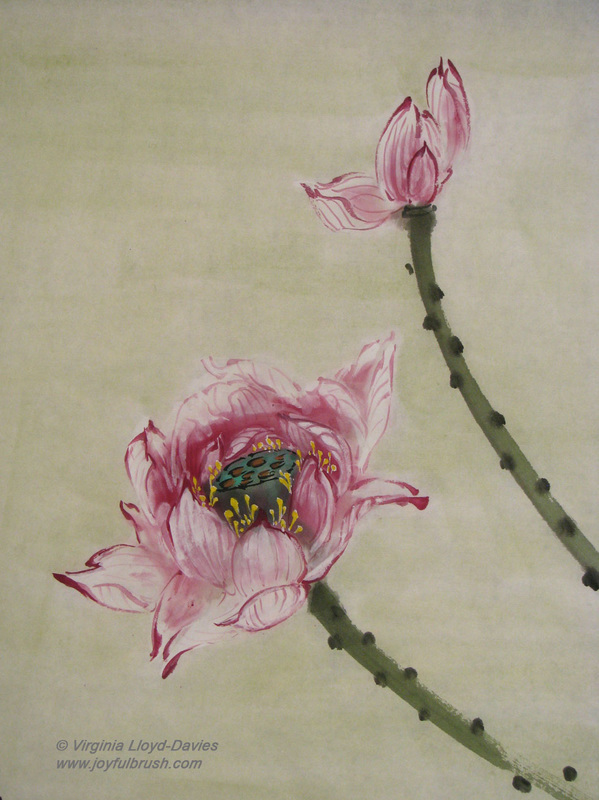 Here is a different style of lotus flower, using white on top of red while the paint is still wet to create the petals. If you wait until the flower is dry, you can add a wash to the back of the paper and the white petals will show up clearly. Below you will see how the flowers pop out when I add outline in red , then turn the painting over, spray the back with water and apply a soft greenish-yellow to give a background color. Yes! This is the same painting! I encourage you to try many different styles. 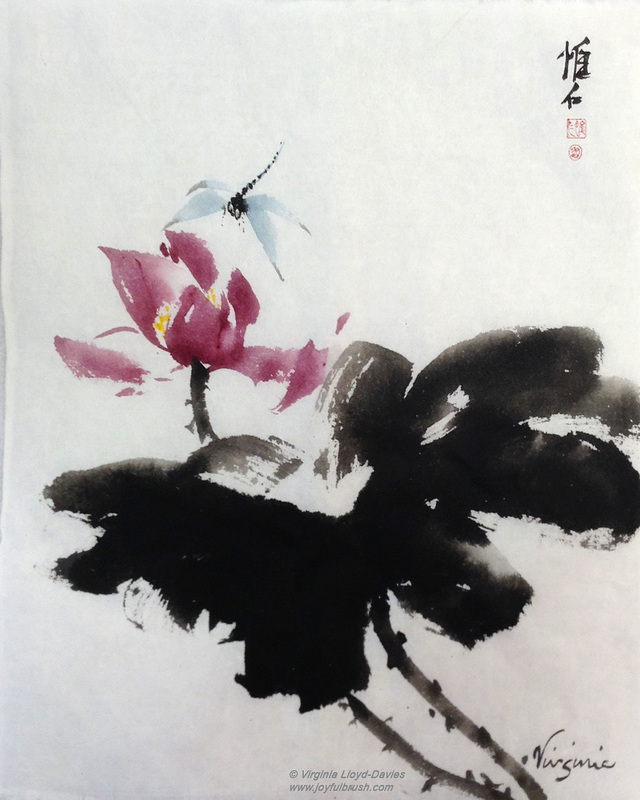 You can see more of my lotus paintings here. You can also watch more of my 'how-to' lotus videos on YouTube here. Good luck, and happy painting! 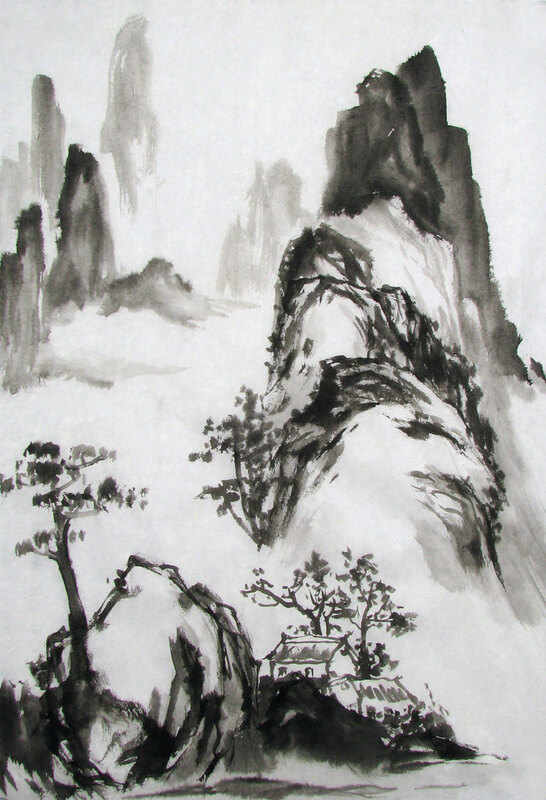 Painting with Chinese brush technique since 1976 in 'splashing ink' style has taught me to appreciate the delights of spontaneity. Just as in life, there is no 'perfection' in painting, but there is much joy. Come join me in this adventure!